After a long stretch of unbearable busy-ness with grad school, I’m relieved that it’s over (yay!) but now find myself with much more time on my hands (still yay!). However, I’m also in the midst of a stressful job search (boo) but truth be told, I’m hoping I don’t find one TOO soon as I’m really enjoying all of this newfound free time. 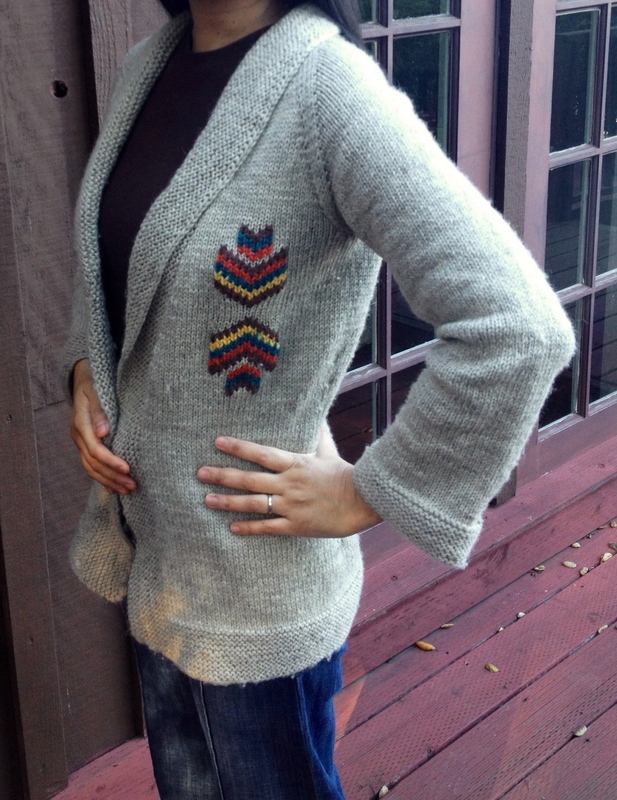 And this seamless shawl collar cardigan is one of the fruits of my freedom. After a long stretch of unbearable busy-ness with grad school, I now find myself with too much time on my hands. Currently in the midst of a job search, but truth be told, I enjoy my newfound freedom! With so much time at my disposal, I knit this seamless raglan cardigan with very affordable (and surprisingly delightful) Lion Brand Fisherman’s Wool. For the basic raglan pattern, I used Knitty’s Shapely Boyfriend, but with garter stitch edges and a shawl collar (instead of 2×2 rib). I didn’t taper the sleeves, as I wanted them to look slightly flared, ’70s style. I also wanted it to hang open, so I didn’t add buttons. I figured if I wanted a closed cardi look, a belt would do the trick. Since I was looking for a project with a load of brainless knitting that I could do while watching TV, all of the (self-designed) colorwork was embroidered on (using duplicate stitch) afterward. I had such great results with duplicate stitch in the past that I’ve planned a load of projects using it instead of stranded colorwork. If you haven’t done it yourself, give it a try. However, because you’re doubling up on yarn at the location of your colorwork, be aware that the area you embroider will be a bit stiffer than the rest of the piece, as well as raised — sort of like one of those old school iron on patches. I, for one, don’t mind this. 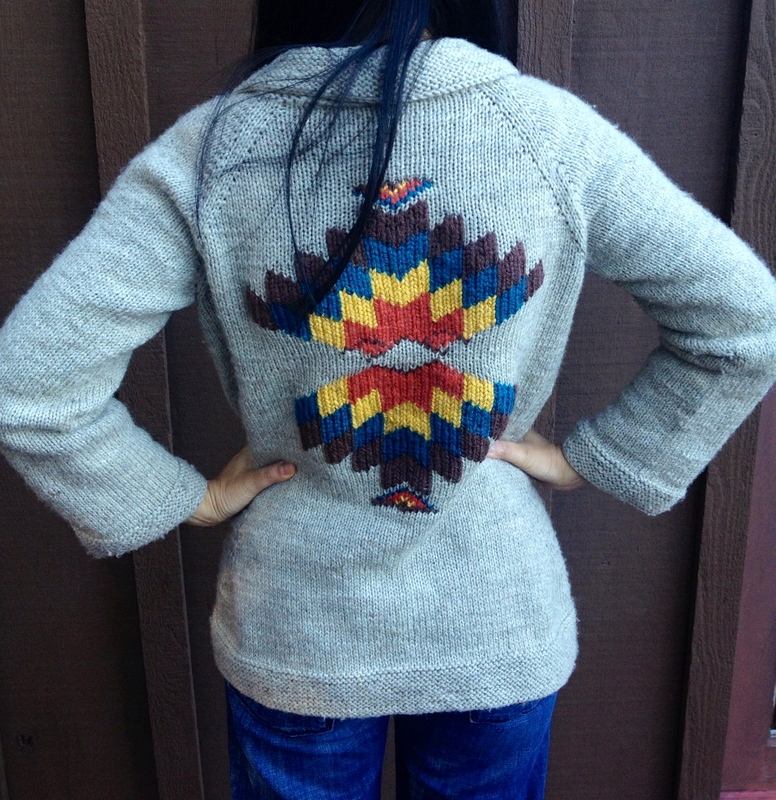 I love the resulting cardigan and have been wearing it to death, as L.A. recently went through a bit of a cold spell. The wool pills quite bit, but I expected as much. Good news, though, is that it’s gotten softer with wear. The perfect cozy cardigan to wrap around myself while sipping creamy Mexican hot chocolate on a chilly evening. 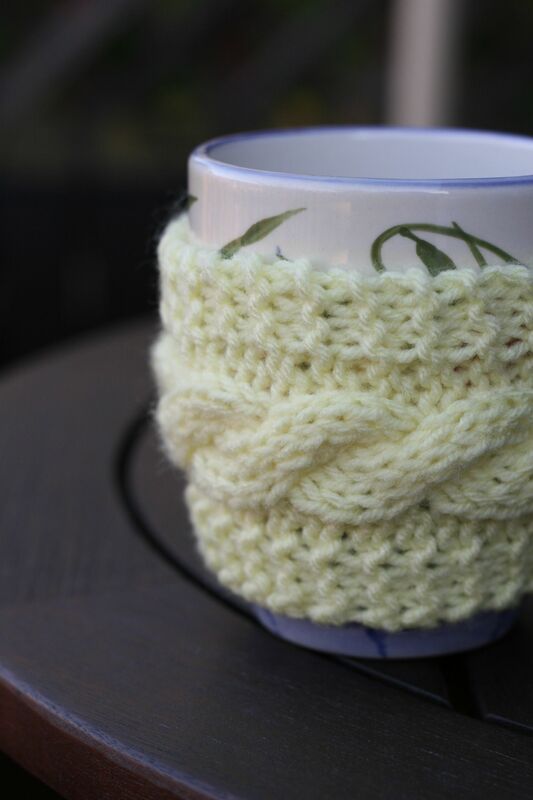 Since I’ve gotten quite a few queries on how I made the Christmas gift mug cozies blogged about here, I’ve decided to post these quick patterns I threw together. Sorry in advance if you catch any errors as pattern writing isn’t really my forte. Any corrections are welcome. Enjoy! Any worsted weight yarn will do. US Size 8 needles. CO 4 and knit two rows. 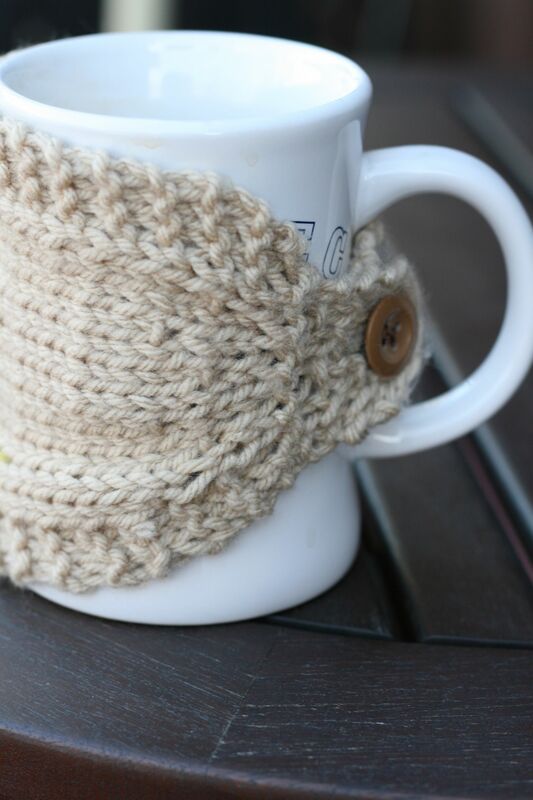 Now, choose one of the following two options for the rest of your cozy — cabled or plain. Repeat these last 2 rows until your body is the desired length (ending on a twist row). Start on button strap. Repeat these last 2 rows until your body is the desired length. 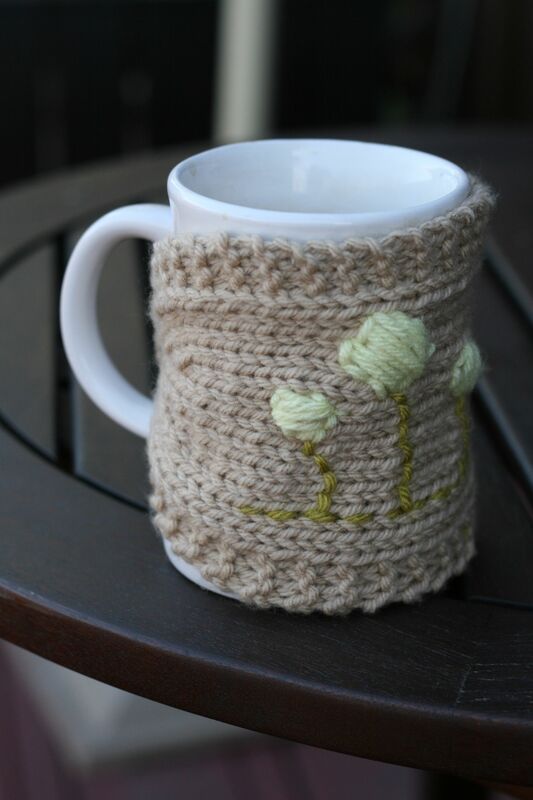 Add an embroidered design to your cozy, if so desired. I’m finally home (hurrah!) after a year spent in Northern Ireland working on an M.A. at Queen’s University Belfast. I’m supposed to be fully immersed in researching/writing my dissertation (due in a few months), so I swore up and down that I would not start a new craft project until I was finished with it. Then I promptly ignored myself and picked up my knitting needles. I blame Danish television, for which I currently have a slight obsession. It started when my husband introduced me to Forbrydelsen (or The Killing — the US TV version of which pales in comparison), then we progressed to Bron/Broen (the Bridge — a Danish/Swedish production), and we’re now quickly making our way through Borgen. If you’re looking for addictive, pulpy-yet-smart television, then jump aboard the Nordic bandwagon! Alright, so what does this have to do with knitting? 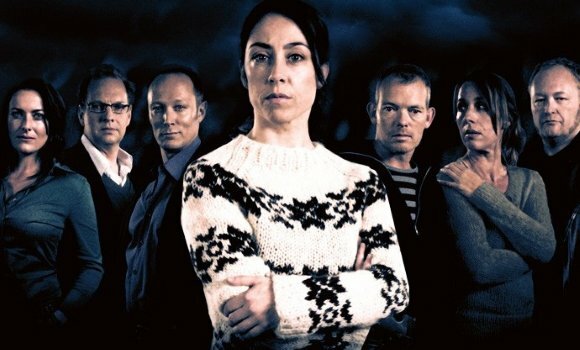 Well, if you know anything about The Killing, you’ve probably heard about the famous “Sarah Lund sweater/jumper” — an article of clothing that the detective heroine of the show wears so often it should receive co-star billing. Indeed, there is an entire website dedicated to it and a YouTube spoof inspired by it. So, after doing some research online (mostly on Ravelry where many have made terrific renditions of this sweater — just search projects using the keywords “Sarah Lund”) I got to work. 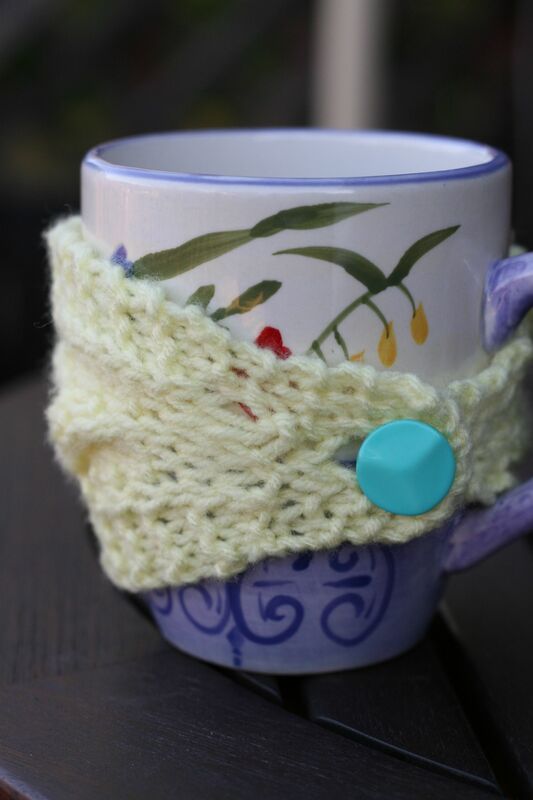 Ravelry member sunshinewheels provides some great notes (albeit not a detailed pattern) on how she knit hers up. 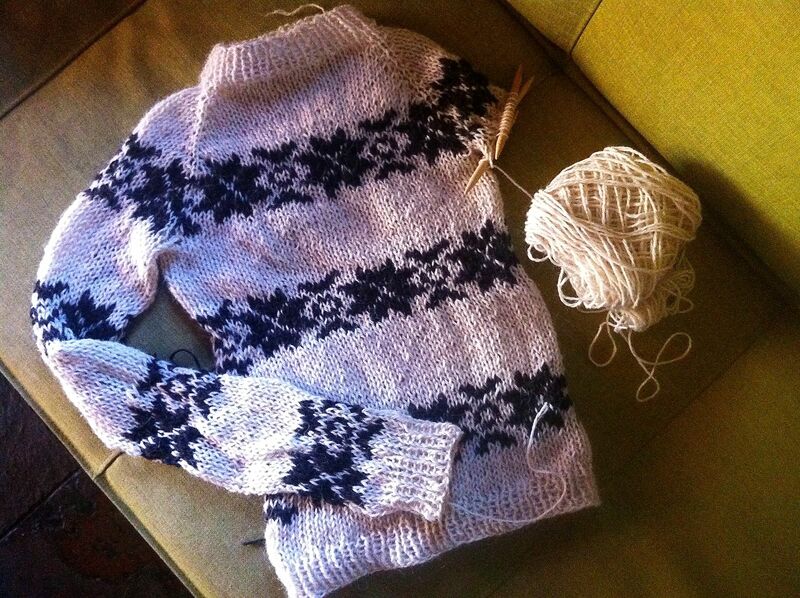 The actual sweater is made by Gudrun & Gudrun and is available to purchase here, but if you’re not prepared to drop 280 euros (about $350) then you can buy the exact wool used for the sweater from the Faroe Islands (which I did) and make your own (which I am doing). The problem is, it fits very, VERY snug on me. Hopefully blocking will do the trick, but I fear I’ll have to give this one up to someone of more petite build. Still, it’s a fun project and a much needed diversion from the schoolwork. Too much of a diversion, though, I fear!